Just like car insurance, it is mandatory in North Carolina to have the state required liability and uninsured motorist coverage for your motorcycle or moped. Since liability coverage only takes care of the other parties when you are at-fault, you might want to consider other optional coverage to protect yourself. These options are medical payments, collision insurance, comprehensive insurance and uninsured/underinsured motorist coverage. We’re all human and sometimes we make mistakes. If you are at-fault in an accident, this policy will pay for any damage you caused to the other property as well as any medical bills for the other parties. This policy doesn’t cover your medical bills or the costs to repair your motorcycle; regardless of who is at fault. In case you are involved in an accident, it is likely your bike will need repairs. With NC motorcycle insurance, if the other party is at fault and they are properly insured, their insurance will take care of this. However, if it is your fault or the other party is not adequately insured, then collision insurance will pay to repair your motorcycle back to its original condition. Collision insurance generally carries a deductible which means you will have to pay this amount when getting your bike repaired. Medical payments coverage pays for your hospital and other medically necessary treatments you or a passenger might receive as a result of an accident. This coverage pays regardless of fault. Limits for medical payments is not very high but it may help fill some of the gaps with your health insurance policy. Therefore, this should not be considered a replacement for health insurance. If you are looking to protect your motorcycle from acts of vandalism, theft, fire or weather related incidents, then you should be sure to include comprehensive insurance on your motorcycle policy. If you have been involved in an accident that wasn’t your fault, and the other party does not have adequate insurance coverage, then this coverage helps pay for any medical bills, lost wages and damage to your property. Uninsured motorist provides benefits if the other party has no insurance at all. Underinsured motorist helps in case they don’t have ENOUGH insurance to take care of you. There are thousands of uninsured drivers on the road, so this is a very beneficial coverage. 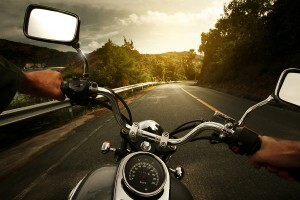 The reality is that minimum liability motorcycle insurance isn’t a choice. You must have a policy and show proof of coverage to register your bike and get your tags here in North Carolina. In NC, this requirement also includes uninsured motorist. However, underinsured motorist is another optional coverage you might want to consider. Protective Insurance Agencies has insurance professionals who understand motorcycle insurance and would be happy to talk to you about your options. Contact us or stop by our office to talk to one of our motorcycle insurance agents.